VietNamNet Bridge - China’s plan to blast waterfalls and rapids to clear the Mekong River to allow large cargo ships to pass through has raised concerns among the public as it will damage the habitat for marine life and harm people’s lives. Seven vessels from China’s southern province of Yunnan have arrived in Chieng Rai, Thailand to serve the plan to clear 200 kilometers of a narrow passage of Mekong River. The survey will last 55 days at 15 points across the Mekong, starting from the Golden Triangle, the intersection area of Laos, Myanmar and Thailand. International specialists fear that China may use explosives to knock down rapids to facilitate traffic. Duong Van Ni from the Can Tho University’s Environment & Natural Resources warned that China’s action will have serious impact on the currents of the Mekong. Ni said the blasting of the Mekong will harm the ecosystem. The loss of natural rapids means the decrease of the amount of oxygen below the current. “There are some kinds of very big fish weighing up to hundreds of kilograms living on Mekong. The big fish require big volume of oxygen to live. And the existing natural waterfalls and rapids can create oxygen for them,” Ni explained. The whirlpools and hollows are the places where fish come to breed in dry season. Now that China uses land mines to make the river bed flat, there will not be enough oxygen in the water for fish to survive. “People’s daily lives will also be seriously affected,” Ni said. Le Anh Tuan, deputy head of the Institute for Climate Change Studies, said any country planning to conduct activities that may affect the stream of Mekong must release information about their plan and consult with the Mekong River Commission (MRC). China is now the official partner of MRC. “I wonder if China has reached any agreement with Thai and Lao authorities before carrying out the survey. However, as a scientist, I protest the use of mines to collapse waterfalls and rapids,” he said. “If this happens, it will take away the shelter and the breeding grounds for many fish species and upset the natural law in this area,” he said. 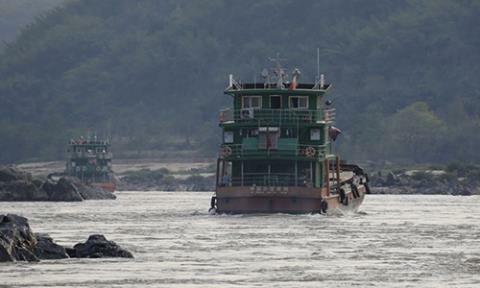 “China said it wants to clear passages for easier navigation on the river. However, I think it is still necessary to learn more about its political and military intentions,” Tuan said. Ni said that Vietnam’s Mekong Delta’s people will suffer from Chinese activities of exploiting and affecting the natural waterfalls and rapids system on Mekong with mines.